Many experts say lack of trust will not be a barrier to increased public reliance on the internet. Those who are hopeful that trust will grow expect technical and regulatory change will combat users’ concerns about security and privacy. Those who have doubts about progress say people are inured to risk, addicted to convenience and will not be offered alternatives to online interaction. Some expect the very nature of trust will change. Trust is a social, economic and political binding agent. A vast research literature on trust and “social capital” documents the connections between trust and personal happiness, trust and other measures of well-being, trust and collective problem solving, trust and economic development and trust and social cohesion. Trust is the lifeblood of friendship and caregiving. When trust is absent, all kinds of societal woes unfold – including violence, social chaos and paralyzing risk-aversion. Moreover, the rise of the internet and social media has enabled entirely new kinds of relationships and communities in which trust must be negotiated with others whom users do not see, with faraway enterprises, under circumstances that are not wholly familiar, in a world exploding with information of uncertain provenance used by actors employing ever-proliferating strategies to capture users’ attention. In addition, the internet serves as a conduit for the public’s privacy to be compromised through surveillance and cyberattacks and additional techniques for them to fall victim to scams and bad actors. If that were not challenging enough, the emergence of trust-jarring digital interactions has also coincided with a sharp decline in trust for major institutions, such as government (and Congress and the presidency), the news media, public schools, the church and banks. Billions of people use cellphones and the internet now and hundreds of millions more are expected to come online in the next decade. At the same time, more than half of those who use the internet and cellphones still do not use that connectivity for shopping, banking, other important transactions and key social interactions. 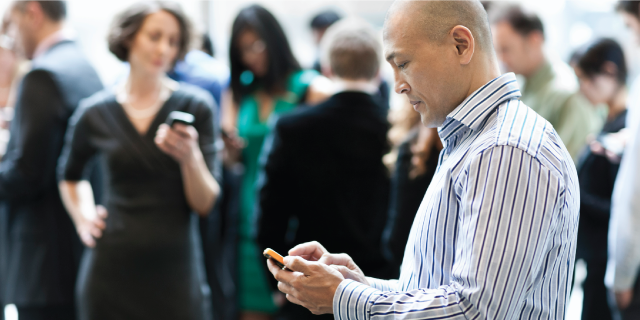 As more people move online globally, both opportunities and threats grow. Will people’s trust in their online interactions, their work, shopping, social connections, pursuit of knowledge and other activities be strengthened or diminished over the next 10 years? Participants were asked to explain their answers and were offered the following prompt to consider: Which areas of life might experience the greatest impact? Economic activity? Health care? Education? Political and civic life? Cultural life? Will the impacts be mostly positive or negative? What role might the spread of blockchain systems play? Many of these respondents made references to changes now being implemented or being considered to enhance the online trust environment. They mentioned the spread of encryption, better online identity-verification systems, tighter security standards in internet protocols, new laws and regulations, new techno-social systems like crowdsourcing and up-voting/down-voting or challenging online content. One particular focus of participants’ answers involved blockchain technology, because our follow-up prompt specifically asked people to consider the role of blockchain in the future of trust on the internet. Blockchain is an encryption-protected digital ledger that is designed to facilitate transactions and interactions that are validated in a way that cannot be edited. Proponents have high hopes for the spread of blockchains. The Economist magazine has argued that blockchain “lets people who have no particular confidence in each other collaborate without having to go through a neutral central authority …. In essence it is a shared, trusted, public ledger that everyone can inspect, but which no one single user controls.” A more-complete outline of how blockchain operates and these survey respondents’ predictions about its future can be found in the discussion about Theme 4 later in this report. The majority of participants in this canvassing wrote detailed elaborations explaining their positions. Some chose to have their names connected to their answers; others opted to respond anonymously. These findings do not represent all possible points of view, but they do reveal a wide range of striking observations. Respondents collectively articulated six major themes that are introduced and explained below and are expanded upon in sections that begin later in this report. The following introductory section presents an overview of the themes found among the written responses, including a small selection of representative quotes supporting each point. Some comments are lightly edited for style or due to length. About half the respondents to this canvassing believe that trust online will be strengthened in the next decade. Their reasoning generally flows in two streams: 1) Some expect to see improved technology emerge that will allow people to have confidence in the organizations and individuals with whom they interact online. They argue that improvements in identifying and authenticating users will build trust. They also maintain that the corporations depending on online activity have all the incentive they need to solve problems tied to trust. 2) Some say trust will grow stronger as users employ online activities more fully into their lives. They think this will be led by younger users who are fully immersed in online life. One striking line of argument, particularly among some of the most prominent analysts responding to this canvassing, is that trust will become a more conditional and contextual attribute of users’ online behavior. They argue that trust is becoming “transactional” – an idea distinct from the notion that trust is a kind of property tied to an individual, group or organization. A number of respondents added that throughout human history the highest levels of trust are often found within personal networks, rather than via organizational actors. Are people “placing trust” in a technology when they use it or are they just willingly taking a chance in order to obtain or attain something they desire? A significant share of participants think it is the latter. They argued that the level of online activity by 2026 might make it appear as if the level of trust is fairly high, but the more appropriate way to interpret it will be that people are resigned to operating in an environment that does not allow them to be selective about whom they trust. Some respondents argued that trust cannot be assumed to be an element of transactions, and many who used the word “trust” in saying they expect higher participation in online interaction may likely agree that their use of it was as a slightly inaccurate umbrella term used to match up with the language of the survey question and that it actually might signify they see a likely rise in people’s participation, trusting or not. Convenience is one of the most-recognized features of all new technologies, including the internet. A number of respondents made the case that it is the convenience of using popular internet applications that makes the internet most appealing and addictive. Further, they noted that it is convenience that creates the most challenges for internet users when it comes to trust. In making trust decisions, people weigh risk and reward and generally choose reward. Some respondents noted that there will be no alternative but to use online systems, whether they trust them or not – and many who use them will not necessarily do so because they “trust” them. Such a dependable ledger could conceivably be used for securing any kind of transaction, and that has prompted advocates to argue that it could replace the kinds of activities now performed by trusted – and expensive – intermediaries such as banks, firms that validate real estate transactions, accounting operations and legal services. 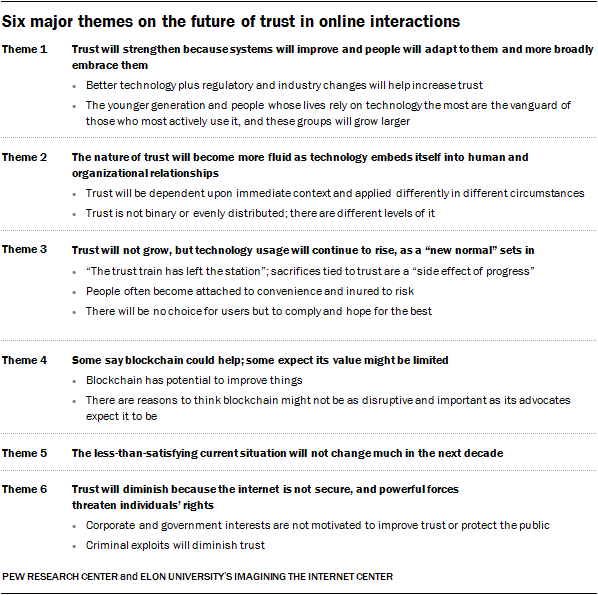 Of course, this might powerfully affect the overall level of trust in online interactions, thus we asked respondents to consider in their written elaborations the impact of blockchains on trust in the next decade. A number were quite positive, but some expressed reservations about how rapidly and effectively blockchains would be adopted. Some respondents in this canvassing expressed doubts about the efficacy of blockchain. About a quarter of respondents to this canvassing predicted that trust will stay about the same in the next decade. They generally see a persistent arms race between those trying to exploit the vulnerabilities of the internet – regularly shattering the trust of at least some users – and those trying to fight back. They see no end to cybersecurity problems. A number of the most highly respected experts, many of whom preferred to remain anonymous in answering, were among the quarter of respondents who said they expect trust will actually diminish over the next decade. They listed various reasons, but those cited most often were: 1) Corporate business models are tuned to profit-making and government motivations tend toward national security, leaving little attention paid to individuals’ rights to personal privacy and personal security protections. 2) The internet was not created with trust-building in mind, and criminal exploits and other manipulative gaming of networks by political and social actors are expected to rise, possibly exponentially, in the future. Another anonymous respondent wrote, “The dystopian, tiered future of science fiction is going to be considered a quaint underestimation. There will be a hated elite of genuinely computer-literate people who will be relied upon to maintain the oligarchical power structure we have now. Beyond those pointed themes, some respondents wrote answers that looked at the grand sweep of the trust problem and how it will evolve. This section features responses by several of the many top analysts who participated in this canvassing. Following this wide-ranging set of comments, a much more expansive set of quotations directly tied to the six primary themes identified in this report begins on Page 34. “Phones are already extensions of our hands and minds. Yet they are also only a nine-year-old technology (dating from the advent of apps, in the summer of 2007), and dominated by handheld units that tend to be replaced by their owners about every 18 months. Meanwhile, the services behind many of the most-used apps are becoming more intelligent, complex and opaque about the full extent of what they are up to. We tend not to see these services’ involvements with surveillance, manipulative algorithms, artificial intelligence and collaborations with parties unknown. For the most part this seems benign, but on the whole it masks a loss of agency behind a gain of convenience. “But the most important moves will not be made by big business. Instead they’ll be made by independent individuals and smaller businesses that need to interact in a fully trusting way, where exposure to risks and bad acting are minimized by point-to-point and end-to-end conversations, transactions and relationships. There will also be a rise in conditional sharing of personal information on a need-to-know basis, and on terms set by individuals as well. Some of these terms will be sourced in neutral and trusted dot-orgs such as Customer Commons, which will do for personal terms what Creative Commons did for personal copyright. Barry Chudakov, founder and principal at Sertain Research and StreamFuzion Corp., replied, “While database hacking and identity theft will continue to bedevil users and make headlines, for most of us, convenience and immediacy will continue to far outweigh trust in our online interactions over the next decade. Today the default position of virtually every business is to move online. Try calling an insurance company or an airline to ask a quick question: The queue has moved from outside the store to the 888 number. Online is the new landline …. While some may grumble about the impersonal nature of online interactions, most people have little choice but to trust the online experience. If you don’t want to physically visit and buy from a brick and mortar store, what else is there? Most people will say or think: The decision has been made and I wasn’t part of the decision-making. “As a result, people’s trust in online interactions will be implicit, unconscious. It is now, and will continue to be, like driving a car on roads where accidents happen regularly. You need to go somewhere so you get in the car, despite traffic and road construction and obstacles and even the danger of accidents. This doesn’t mean you won’t at some point complain about highway congestion; likewise, people will continue to both like the ease of online interactions yet grumble about security, identity chasing and tracking as they conduct more business than ever in cyberspace. “There is no area of life that won’t be affected. Economics, health, education, politics, culture – all are changed by the interaction of devices and the Internet. This is because as people use cellphones and the Internet we have tangibly altered reality …. The impacts are and will continue to be both positive and negative; this is because the impacts are revolutionary and, again, cannot be contained by binary formulations. This new reality changes our behaviors and especially how we see others and ourselves. Cellphones, smart devices, are now instruments of documentation, and in this measure, are tools of validation. I text, therefore I am. I am here. This is what I saw. I am alive. I am dressed (or undressed) a certain way …. The act of showing the act may now be more important than the act itself. This is not inconsequential: Crimes that might have gotten a slap on the wrist now send athletes and others to jail or into retirement because a cellphone captured their questionable (or criminal) behaviors. Citizen journalists who witness a disturbance, a shooting, an accident, especially with political overtones, are now not only adjuncts to the news – they are the news. They are bringing us first-hand reports that are raw, unfiltered and often devoid of context. Yet, the immediacy of these reports – the lack of filter, and often the lack of vetting – is both thrilling and disturbing.